I so wanted to love this book, y’all. I read the book summary and got all flustered and excited and let my expectations zoom up to the sky (which often comes back to bite me in the you-know-what). I had nothing to fear. 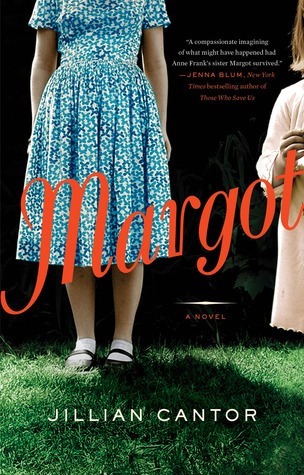 Margot by Jillian Cantor lived up to all of my expectations and more. This was a powerful and haunting tale of a woman who, after being hidden away in a tiny annex for two years, lived through hell only to spend her days back in hiding – but this time in plain sight. It is 1959. Margie Franklin is a secretary at a Jewish law firm. She is friends with the girl at the desk next to her. She has a crush on her boss. Every day stuff, right? Not so much. Margie also makes sure she is always wearing long sleeves, despite the temperature outside. She is hiding a tattoo she received years ago as a prisoner at a Jewish concentration camp in Poland. No one in her life knows this, not even the kind couple who sponsored her immigration to the United States. Margie lives her life quietly, alone with her memories and nightmares, and her fear of being discovered. During her time in Philadelphia, Margie discovers that her father (pet name: Pim) has also survived, and has published her sister Anne’s diary. Everywhere she goes, she is faced with The Diary of a Young Girl in store windows. And one day when she leaves work, the theatre across the street is advertising a new movie: “The Diary of Anne Frank”. Everywhere around her, people are talking about her sister – and Margie feels even more strongly that she needs to keep her true identity – Margot Frank – a secret. Soon, however, situations begin to present themselves which threaten to expose Margie/Margot. A new client at the law firm seems to see right through her façade. She is forced to visit a synagogue and meet with a rabbi. Her sponsor starts asking questions. Her relationship with her employer changes, and she is tempted to be truthful with him. Panic sets in and all Margie/Margot can do is deny, deny, deny. This imaginary tale of what would have become of Anne Frank’s sister had she escaped the Nazis during WWII absolutely captivated me from the moment I opened it until I read the last page – which I did in nearly one sitting, I might add, so entranced was I with the story. Jillian Cantor has masterfully written a novel that will surprise many with the emotion it brings into play. She has skillfully woven together scenes from Margie/Margot’s present-day story in 1959 with her memories of the past, and her fears of the future, bringing all of it together into one beautiful, powerful story that you will not easily forget. Margot by Jillian Cantor is on sale now. Buy it. Read it. Love it. I just finished this book today and put up a review on Goodreads as well. LOVED! It was just so great, wasn’t it? I’ll have to look for your review!